Rio de Janeiro Airport (GIG) is one of South America's major international gateways, connecting travelers between Brazil's most famous city and hundreds of destinations worldwide. GaleÃ£o - Antonio Carlos Jobim International Airport is Brazil's principal international airport, located 13 miles (20 kilometers) north of Rio de Janeiro, on Governor's Island in Guanabara Bay. GIG provides easy connections to central Rio via two main roads and hourly shuttle buses serving Rioâ€™s stunning beaches and major hotels. GaleÃ£o International Airport in Rio handles around five million passengers a year, with two terminals offering a wide range of traveler amenities, including restaurants, bars, shops, plus ATMs, banks, business, medical, and special needs facilities. 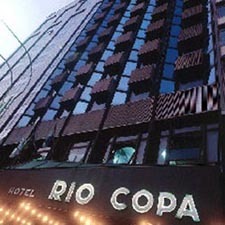 Rio de Janeiro World Airport Guide provides you with access to a complete selection of Rio Airport hotels. Utilize the discounts offered directly from the hotel, with the assurance of secure booking. Extra services include airport car rental, airport car parking and flights to and from Rio de Janeiro Airport. Please note: The term GaleÃ£o-Antonio Carlos Jobim International Airport GIG as well as all associated graphics, logos, and/or other trademarks, tradenames or copyrights are the property of the Rio De Janeiro Airport authority and are used herein for factual descriptive purposes only. We are in no way associated with or authorized by the Rio De Janeiro Airport authority and neither that entity nor any of its affiliates have licensed or endorsed us.